Cilicia, Tarsos, Satrap Pharnazabos (380-374/3 BC). Obverse: Head of Herakles facing, inclined slightly to right, wearing a lion’s skin headdress, Cilician legend; HLK. Reverse: Bearded male head facing left, wearing a crested Athenian helmet, TEPΣIKON (only partially visible). Rare. Attractive cabinet tone. Very fine. Ex A. Franklin Collection. 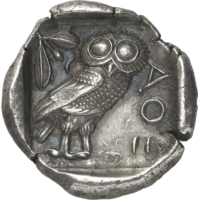 (R A Moysey, ‘The Silver Stater Issues of Pharnazabos and Datames from the mint of Tarsus in Cilicia’, ANSMN 31, 1986, pl. 2, 25; SNG France 240; BMC 22).